Why I Picked This Book: I really enjoyed the previous book in the series and then there's a murder at a Zombie Fun Run. I couldn't pass it up! My Impression: While this is my 2nd book in the series it was my first visit to Crystal Haven ( the last book took place in another town) and I loved it! Crystal Haven is definitely a fun and quirky little town filled with interesting characters. Clyde is the kind of sleuth I love in a cozy. She's smart and has common sense and when the common sense does abandon her as it does on occasion I can understand why. Her background in law enforcement makes her interest in investigations make sense. She has a strong connection with her family though they do occasionally drive her crazy (and for good reason!) and her relationship with police detective Mac is solid. I like that they respect each other and that he listens to her theories instead of dismissing her. In this book we meet Clyde's sister Grace with whom she has a complicated relationship. 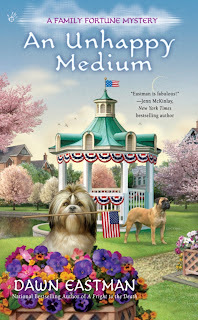 There are real reasons for the strain between Grace and the rest of her family made even more complicated by Grace's actions and the fact that Grace's oldest son Seth now resides with Clyde and Mac. The mystery takes a little while to actually get started though that doesn't mean the book itself is slow in the beginning. There's a lot going on and it kept me interested and engaged. I liked seeing the different opinions about the Zombie Fun Run, the prep work that went into it, and was wondering right along with Clyde just what Grace was up too. When the body falls I was even more sucked in. Normally I can guess the culprit pretty early on but I really had no idea in this one and was surprised at the reveal though it did make sense. My one complaint is that there are a few side notes that I would've liked explained a little more but that's pretty minor. This is a series I've had no trouble jumping into midway though I do plan on going back and reading the earlier books. I'm looking forward to seeing where the series goes - especially in regards to Clyde and Vi's new business venture. There's a lot of potential for really interesting mysteries there! I'm also really looking forward to seeing more of Seth and his abilities. This is a really fun series with lots of humor without it getting too slapstick but manages to keep the mystery front and center. The Fortune family is definitely a family I want to get to know better! Giveaway: You can win your very own copy of this book and see what all the fun is about! Just leave me the title of your favorite mystery along with an email address where I can contact you. The giveaway closes on Tuesday, April 12 at 11:50 PM CST. I'll notify the winner Wednesday morning. US address only and no PO Boxes. Good luck! Would I Read More of this Series/Author? : Definitely! I'm looking forward to going back and reading the first 2 books and I can't wait to see what happens next! Would I Recommend this Book? : If you like cozy mysteries be sure and pick up this series. I think you'd love it! I enjoy the Fat Cat mysteries. I'm not sure why, but this sort of makes me think of Murder She Wrote. I Absolutely adored that tv show. So hard to choose just one favorite, so I'll choose a recent favorite. A Clue in the Stew by Connie Archer was a great cozy mystery read. Looking forward to reading An Unhappy Medium. Glad you had a good time reading this one. Which just means you've now grown your cozies reading list even more. Good luck. Lol! My current favorite is Breach of Crust, the latest of Ellery Adams' Pie Shoppe Mystery series. Anything I just finished reading by her would be my current favorite. I love all of her series! A zombie run! A couple of my coworkers have participated in a couple now. They keep saying they want to be the zombies one of these times. :-) It sounds like Clyde and Mac have a good relationship--I like that in a book like this too. This sounds like a fun series, Katherine. Picking a favorite is hard . . . I think my favorite cozy mystery is Charlaine Harris's Shakespeare's Landlord. I enjoy the mysteries by Diane Mott Davidson. I like the recipes, too. Right now I am enjoying Reading up a Storm. I love the idea of a library in a lighthouse. I recently finished Murder on Wheels by Lynn Cahoon, my first book in A Tourist Trap series, which is actually #6 in the series. I loved it and can't wait to read the others in the series. My favorite mystery series right now is tne cycle path mysteries. I just finished "Breaking for Bodies" and really enjoyed both books in the series. I really want to read this series. I have them in my TBR. This one sounds like so much fun, Katherine! I would read it for the zombie fun run alone. The Zombie fun run does sound good! I just finished a new book in a favorite series, Churn for the Worse by Laura Bradford. I love "Coffeehouse Mysteries" by Cleo Coyle. Which one? Well, reading each book is just a new adventure for Clare Cosi...I enjoy them all. However, Dawn Eastman's book could be a new favorite for me. Only one favorite mystery? Can't do it. If pressed (really, really, really pressed) I can cut my list off at two series: Donna Andrews' Meg Langslow series and Maddy Hunter's Passport to Peril series. For one that's not part of a series I would have to go classic and say Agatha Christie's And Then There Were None (or maybe Mary Higgins Clark's Love Music, Loves to Dance). See what I meant? I just can't narrow it down! Thanks for the chance to win what sounds like a really great book. Thank you for featuring the book! And good luck to all the commenters! One of my favorite cozy series is Rhys Bowen's Royal Spyness series. The Seven Dials Mystery by Agatha Christie is one of my favorites. I also love Joanne Fluke's Hannah Swensen series.